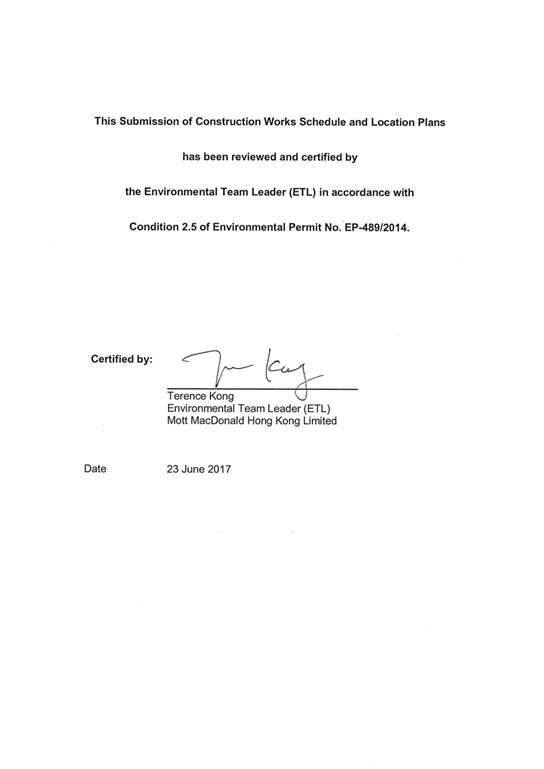 The first submission of Construction Works Schedule and Location Plans (CWSLP), in compliance with Condition 2.5 of the EP, was made to the Environmental Protection Department (EPD) on 18 September 2015, and finalized and released via the project’s dedicated website in October 2015. This updated submission is to include a more detailed description of ground improvement works and seawall construction, reflect the latest work scope for the diversion of submarine cable works and provide updated indicative phasing plans for Land Formation Works. e) Indicative phasing plans for the land formation works (in Section 6). The commencement of initial reclamation works was announced on 1 August 2016. The eight-year construction of the three-runway system is expected to be completed in 2024, with the commissioning of the new runway in 2022. The overall phasing programme of all construction works is updated since the first submission and presented in Attachment I. Construction will proceed in the general order of diversion of the submarine aviation fuel pipelines, diversion of the submarine power cables, land formation, and construction of infrastructure, followed by construction of superstructures. It shall also be noted that given the scale and complexity of the project, a number of key project components are still subject to detailed design prior to implementation with future major Contractors yet to be procured. The details of the programme as presented is subject to further revision and update. Diversion of the existing submarine aviation fuel pipelines is undertaken using a HDD method forming two rock drill holes by drilling through bedrock from a launching site located at the west of the airport island to a daylighting point adjacent to the offshore aviation fuel receiving platform at Sha Chau. Two new 500 mm diameter pipelines will be installed through the drilled tunnels. The total length of each pipeline is approximately 5 km. Attachment II presents the latest updated works programme required under EP Condition 2.5(iii). Construction of the HDD works commenced on 28 December 2015 on the airport island. Drilling works are proceeding from the HDD launching site at the airport island. Upon completion the drilling and reaming of the HDD holes, the permanent aviation fuel pipes will be pushed from the HDD launching site to Sha Chau. To limit the impact to Sha Chau Island, pipe fabrication will be done at the airport island side; however a barge would be required and used as a temporary working platform between Sha Chau Island and the offshore receiving platform to facilitate the works. The remainder of the pipe laying between the HDD launching site on the airport island and connection point to the existing pipeline will be installed by open trench method. Diversion of the existing power cables is required in order to maintain continuous power supply to the facilities at Sha Chau. Diversion of the submarine cables will use a direct bury (water jetting) method. The use of water jetting as the preferred method will avoid the need for trench excavation and associated disposal of excavated materials. 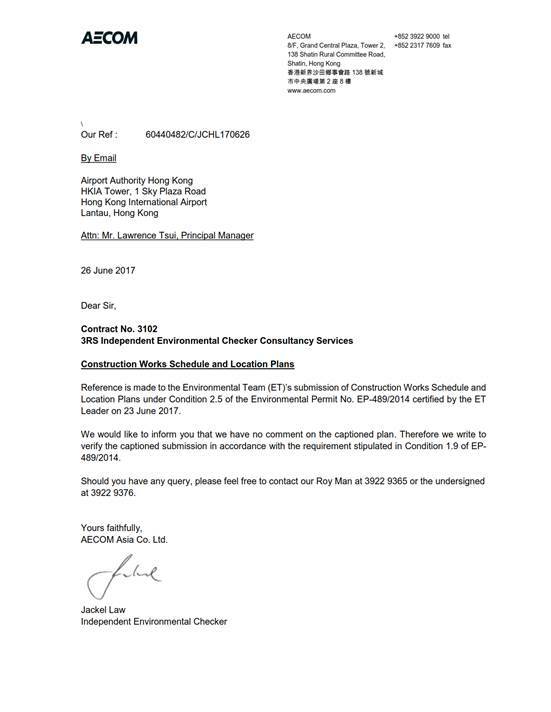 Works will be conducted beneath the seabed from the edge of the airport island to the ‘connecting location’ at least 500m outside the boundary of Sha Chau and Lung Kwu Chau Marine Park. The length of cable installation is approximately 6km marine, with a burial depth of 3m to 5m below seabed level, and approximately 0.3km landside. At the daylighting point of the submarine cables, the cables will cross the existing seawall. A works area on the west side of the existing airport island will be required for the cable daylighting and joining to the existing landside cables. A small section of the existing seawall at Hong Kong International Airport (HKIA) will be excavated by open cut method and cable ducts will be installed before reinstating the seawall. The cables will then run underground, crossing the existing roadway (via cross road ducts) and along the east shoulder area of the roadway to the designated jointing location. The works programme for diversion of the submarine cables required under EP Condition 2.5(ii) was updated since the first submission and presented in Attachment III. a) Land Formation (see Attachment IV Figure 1) – comprising approximately 650ha of land to be formed to the north of the existing airport island, with associated seawalls. There will also be minor marine structures including the runway approach lights and the Hong Kong International Airport Approach Area marker beacons. b) Diversion of aviation fuel pipelines (see Attachment IV Figure 2) – as already described in Section 3 above, diversion of the existing submarine aviation fuel pipelines is undertaken using the HDD method by drilling through bedrock from a launching site located at the west of the airport island to a daylighting point adjacent to the offshore aviation fuel receiving platform at Sha Chau. c) Diversion of submarine 11kV Cables (see Attachment IV Figure 3) – the diverted submarine cables will be installed via water jetting from the edge of the airport island to the existing cables running to the Sha Chau Island. At the daylighting point of the submarine cables, a small section of the existing seawall at HKIA will be excavated and cable ducts will be installed before reinstating the seawall. The cables will then run underground, crossing the existing roadway (via cross road ducts) and along the east shoulder area of the roadway to the designated joining location. d) Airfield Facilities (see Attachment IV Figure 4) – paving structures include the third runway, taxiways, aircraft parking stands, apron roads and airside roads located on the newly formed land, as well as modifications to the existing north runway and midfield apron. Superstructures include the air traffic control towers, fire stations, a fire training pit (to be relocated from the southern part of the airport island), petrol filling station, aircraft maintenance hangars, an aircraft engine run-up facility for performing aircraft engine test runs for the purpose of trouble-shooting or maintenance, air cargo staging facilities, flight catering facilities, ground service equipment maintenance facilities and storage area, airside communications and office buildings, cross dock facility, seawater pumping stations, meteorological station and other airport support facilities or aviation-related developments. e) Passenger Facilities (see Attachment IV Figure 5) – these include the Third Runway Concourse (TRC) (including fixed linked bridges and passenger loading bridges), the Terminal 2 (T2) expansion, the automated people mover (APM) and the baggage handling system (BHS), with associated tunnelling works and ancillary buildings. The TRC will be constructed in phases, with Phase 1 to be completed first, and the remaining TRC area to be completed at a later stage depending on demand. The T2 building will be expanded into a full service processing terminal serving the TRC, comprising an expanded main terminal building, new annex buildings, an underground APM interchange station (AIS), a combined depot for the TRC line and the T1/ SkyPier Lines, and BHS basement. Landside supporting facilities and utilities will also be expanded and enhanced to support T2 operation. f) Road Network (see Attachment IV Figures 6 to 8) – these include the airside road network and tunnels connecting the new land formation facilities to the existing airport island facilities, as well as landside road improvement works at Terminal 2, the southern cargo area and the western perimeter road. g) Infrastructure and Utilities – various infrastructure and utilities will be laid both on the newly formed land and within the existing airport island, including the fuel hydrant system, seawater cooling and flushing system, drainage network, potable water supply, fire fighting system, sewerage network, gas, power, telecommunications, airport systems, and other aviation related utilities and systems. A section of gravity sewer located outside the airport island will also be upgraded (see Attachment IV Figure 9), subject to the future sewage capacity demand. The main components of the land formation works comprise modification and integration of the existing seawall, ground improvement of the underlying marine sediments, seawall construction, filling, and surcharge. 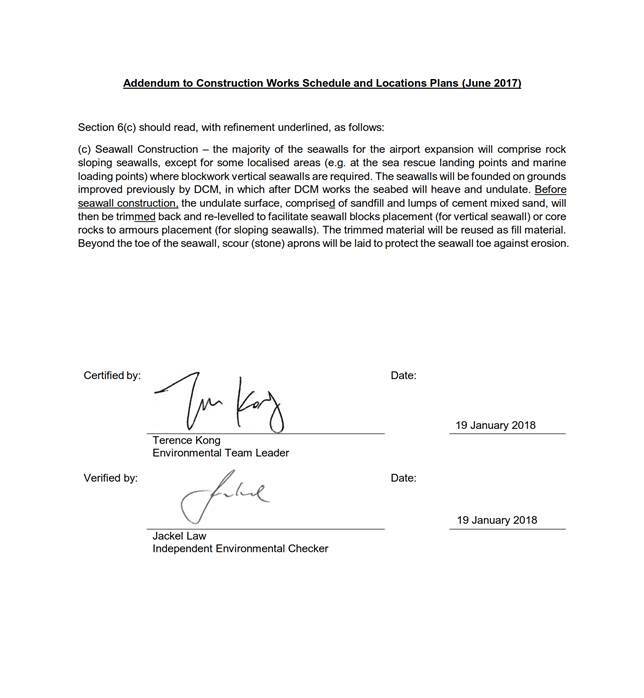 An indicative phasing plan for the land formation works is presented in Attachment V. The phasing plan would be subject to further revision when the contractors’ detailed programme is available. a) Modification of Existing Seawall – the existing rock armour from the seawall will be retained or removed for reuse as far as practicable. b) Ground Improvement – the deep cement mixing (DCM) method will be adopted within the contaminated mud pit (CMP) areas, while DCM as well as other methods (including stone column, prefabricated vertical drain and vertical sand drains) will be adopted outside the CMP areas. Prior to the commencement of ground improvement, hard materials including rock fill left from previous works in the project area (such as existing fuel pipes and existing seawalls) and rubbish on the seabed that will cause obstruction to the works need to be removed. A sand blanket will then be laid on the seabed within the CMP areas to contain and minimise the release of contaminant during ground improvement activities. For specific obstructions that can neither be removed nor overcome, another type of DCM known as Deep Jet Mixing, which cores through the obstruction and is generally not used for area-wide application due to slow speed, will be used for ground improvement below the obstructions. c) Seawall Construction – the majority of the seawalls for the airport expansion will comprise rock sloping seawalls, except for some localised areas (e.g. at the sea rescue landing points and marine loading points) where blockwork vertical seawalls are required. The seawalls will be founded on grounds improved previously by DCM, in which after DCM works the seabed will heave and undulate. The undulate surface, comprise of sandfill and lumps of cement mixed sand, will then be trim back and re-levelled to facilitate seawall blocks placement (for vertical seawall) or core rocks to armours placement (for sloping seawalls). The trimmed material will be reused as fill material. Beyond the toe of the seawall, scour (stone) aprons will be laid to protect the seawall toe against erosion. d) Filling Works – different fill materials including rock fill, public fill, sand fill, rock armour and graded filter layer will be used to form the land and seawalls. Seawalls will comprise of rock fill as the seawall core, and rock armour and graded filter layer to form the protective layers. Sand fill or a mix of sand fill and public fill will be adopted as the marine filling material, while a combination of sand fill and public fill will be adopted for land filling activities. e) Temporary Surcharge – this will primarily comprise marine sand or public fill. During each stage of land formation, surcharge removed from a completed works area will be reused as far as practicable as fill material or surcharge in other active works areas.